Here’s more proof that Dispensational paranoia is running out of substance. A video game based on the Left Behind series of Christian apocalyptic books and movies will debut for the PC in the second half of 2006, Newsweek reported. 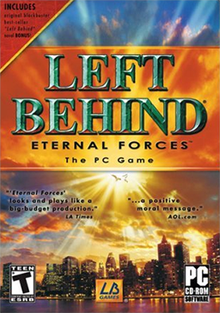 Left Behind: Eternal Forces, based on the books by Tim LaHaye and Jerry Jenkins, places gamers in the position of New Yorkers who are “left behind” after the Rapture, the sudden calling-up of Christian souls that evangelicals believe will mark the beginning of the end times on Earth, the magazine reported. The game will also feature a high level of violence, the magazine reported: Players scour the streets for converts, training them into a work force to feed, shelter and join a paramilitary resistance against the growing forces of the Antichrist. The game will be marketed directly to church congregations and through ads in gaming magazines. 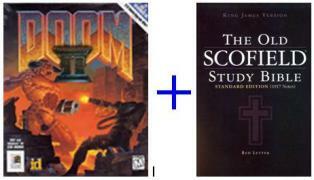 This game sounds like a cross (pardon the pun) between Doom: Hell on Earth and the Scofield Reference Bible as interpreted by Hal Lindsey. Maybe Pat Boone could do the heavy metal sound track for the game. Even Christians need heavy metal music to kill the enemy. Are we trying to legitimize the idea that terrorism and anarchy is ok if we do it in Jesus name and not for Allah? There really is a Biblical basis for war and this game is not the way to learn it. On the bright side, at least Evangelicals like Rick Warren can quit worrying about global warming; afterall, it’s all gonna burn anyway. Look for this game on the overhead projector at your Mega Church’s Saturday Night Seeker Service just in time for Christmas.